Emirates Plane Makes Emergency Landing, Bursts Into Flames In Dubai : The Two-Way All 300 passengers and crew survived, but a firefighter died during rescue operations. 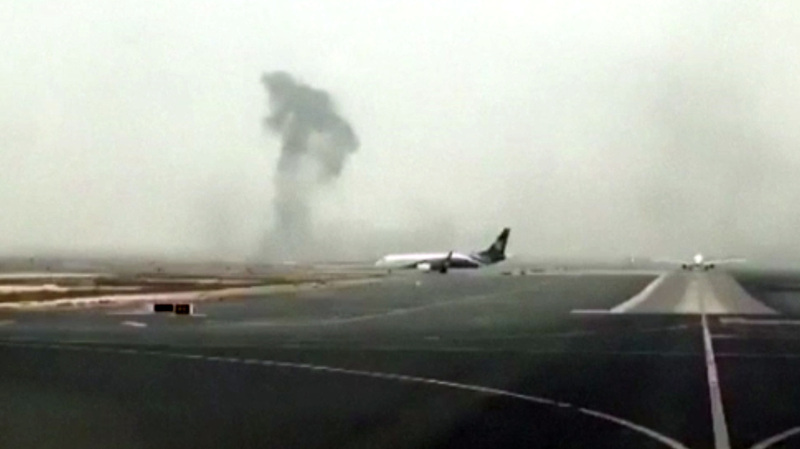 Video on social media shows the plane with black smoke rising. Then a massive fireball erupts from the aircraft. Smoke rises after an Emirates plane made an emergency landing at Dubai International Airport on Wednesday. An Emirates plane made an emergency landing and caught fire at the Dubai International Airport on Wednesday. All 300 passengers and crew survived, according to the the airline said, but the government said a firefighter was killed during rescue operations. Authorities did not immediately explain what caused the incident on the flight from Thiruvananthapuram, India, at approximately 12:45 p.m. local time. "We do not yet have all the information," Emirates Chairman and CEO Sheikh Ahmed Bin Saeed Al Maktoum said in a video statement. "Thankfully, there was not fatalities among our passengers and crew." In a press conference, bin Saeed said "We pay tribute to the firefighter who lost his life fighting the blaze." He added that 13 people were treated for 'minor injuries' and all have since been discharged. Video posted on social media and released by Reuters show the Boeing 777 on its belly on the runway with black smoke rising from its right side. Then a massive fireball erupts from the aircraft, sending debris flying. Firefighters quickly gained control of the blaze, according to The Associated Press. The wire service reported that "the charred fuselage of the plane appeared to no longer be burning. The top of the aircraft was scorched brown from near the cockpit back to its tail. Several yellow fire trucks surrounded the plane." All passengers and crew were safely evacuated from the aircraft by emergency response teams, according to the government. Reuters spoke to one unnamed man waiting for his relatives: "They said they're safe and alright, but that they felt a great panic as the plane was on fire. I'll be comfortable when I see they are safe." The Dubai Media Office announced that all operations were suspended from Dubai International Airport, and later said that it was planning to resume departure operations at 6:30 p.m. local time. According to the airline, 20 nationalities were represented among the flight's passengers and crew — 226 Indian nationals, 24 Brits, 11 Emiratis, six U.S. citizens and six Saudis. A statement from Boeing said, "We are thankful all aboard were evacuated safely," and added that a technical team from the company is "standing by to launch." Authorities have yet to determine what caused the plane to crash land and catch fire. But a report in The Aviation Herald, an industry publication, suggested there may have been issues with the plane's landing. Citing air traffic control recordings, it says the tower operator "reminded the crew of lowering the gear and cleared the aircraft to land." The airplane crew then reported they were attempting a "go around," meaning they plan to make an additional attempt at landing. "The aircraft however did not climb, but after retracting the gear touched down on the runway and burst into flames," the Herald reported.